The pachyderm produces humanlike sounds by putting his trunk in his mouth and shaking it while exhaling — similar to how people whistle with their fingers. But the park said it’s unclear if Kosik knows the meaning of the sounds he makes. 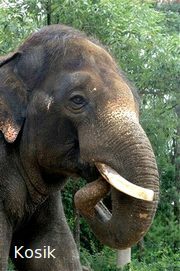 Kim Jong-gap, who has been Kosik’s keeper for 10 years, said he first heard the elephant speak two years ago. There have been studies that suggest elephants can mimic sounds, but the park claims that Kosik displays the ability to imitate a human voice. Spectrograms show Kosik’s voice frequency when he makes human sounds are similar to his keeper’s, Everland said.